After a shaky start as me-too punks Johnny + The Self Abusers; that band split up on the day their single 7″ was issued in 1977 on Chiswick Records. Two members went off to form The Cuban Heels and the remaining four huddled together as the now renamed Simple Minds. Besotted with Patti Smith’s incredible “Horses,” they had originally wanted John Cale to produce their first opus, but their new label, Arista balked. They had signed to Arista since it was the home of stars like Smith and hero Iggy Pop. What the band forgot, was that it was also the home of Barry Manilow, whose profits kept the whole thing afloat. Arista finally acquiesced with the band’s third choice, John Leckie; ironically a staff producer at Virgin Records. Bowie, pre-new wave combo that straddled the gulf between the glam rock of the band’s youth and the Post-Punk directions in which they wished to move. The coup de grace was Leckie’s credit for the band that was ground zero for Post-Punk, Manchester’s Magazine. Now that Simple Minds were signed to a major label and had Leckie in the producer’s chair, their fate was sealed! Were it only that easy. First they had to make the debut album and that was apparently more difficult than they imagined going into it. The group had been playing live for several years by this point and they had mastered their instruments capably. Charlie Burchill not only played lead guitar on the album, but also violin and sax as well! Their heads filled with visions of Roxy Music, David Bowie, as well as their spiritual children such as Doctors Of Madness and Cockney Rebel, the band imagined that their album would reveal them to be the harbingers of the third wave of glam rock, cut sharply in Post-Punk clothing. They couldn’t have imagined what happened instead. When the needle hits side A, the listener first heard “Someone,” a tune with more than a little Sparks influence and a stuttered vocal hook that digs pretty deep. Probably not what they imagined making, but it sounds good and is well played. Their debut single, “Life In A Day” came next and the track’s clockwork beat underpinned a tritone string patch hook and uncharacteristically perky percussion. It would pass muster as New Wave, with it’s look back at the 60s through 70s goggles. It was the next track that laid bare just how short of their ideals that their grasp was at that time. Simple Minds might have hoped that “Sad Affair” was the band’s stab at a retro-kitsch 50’s bobby sox romp like Roxy Music’s “Virginia Plain,” …minus all of the latter song’s dramatic juxtapositions and firm grasp of Post-Modern theory. In the end, it all came out sounding like a Boomtown Rats number. One that would have sat comfortably on “A Tonic For The Troops,” albeit with duller, more pedestrian lyrics. Charlie Burchill’s sax solo was accomplished… and bloodlessly professional in a way the band had probably not imagined themselves moving. It’s not too far from the dreaded Clarence Clemons style. Side one finally ended with a track that was more to the ideal that the group thought they would achieve on their first album. 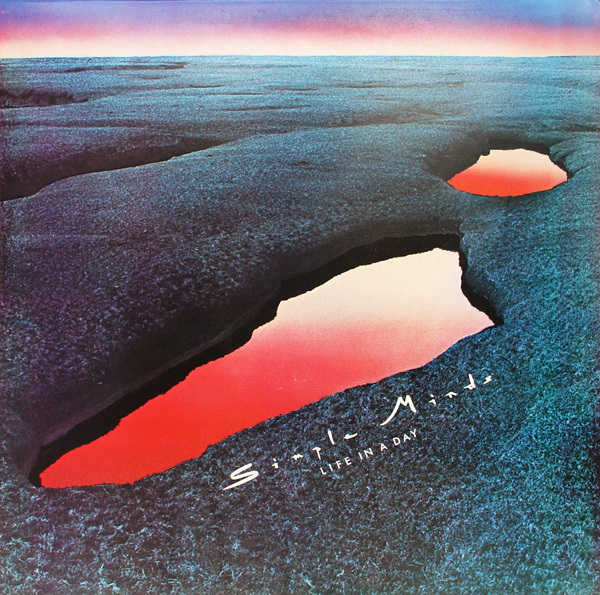 “Pleasantly Disturbed” was a powerful number whose stentorian strings, prominent violin [again, Burchill] and eight minute running time all but announced “we are Doctors Of Madness fans!” The string arrangements vie with those on Japan’s “Quiet Life” for being some of the best to come out of the UK in the late 70s, and the spiritual children of many a Bryan Ferry solo album of the period. Burchill’s heavily tremoloed guitar was used primarily for texture here while violin was the lead instrument. This was the thread pointing the way forward for the band, even if they didn’t know it at the time! That the piece develops and sprawls impressively over its long running time shows that the band had talents that were not getting the full airing they deserved on this album. This entry was posted in Core Collection and tagged John Leckie, Life In A Day, Rock GPA, Simple Minds. Bookmark the permalink. That Life In A Day is not the culmination of years of songwriting and playing where bands “shoot their load” to be frank, and never recover to make another decent album, is probably the best thing that could have happened to Simple Minds. I’ll limit myself to side one here, but as a blueprint, Side One, while not everything it could have been, is deeply etched in the sounds, influences and direction that SM knew they wanted to pursue. Leckie directs the opener Someone out from stage left and presents a band ready to take on it’s audience. There are hints of XTC and BeBop Deluxe in there for sure and the Sparks comparison, Monk, is spot on. But Someone sounds fresh and ready for comsumption. 35 years later it’s still a toe tapping success. Life In A Day is a track that to this day I can find invading my mind and sticking me for hours on end. It is certainly Post Punk. It shares that naive confidence that early Magazine reflected out to the world. The hurdy-gurdy rhythm is Post Punk tearing at Krautrock’s Apache beat while paying homage to Roxy Music’s influence as well. It’s a massive success of a single! Where Sad Affair may be a bit to New Wave by numbers – again spot on Monk with the sub Boomtown Rats comparison, the next track, All For You, makes up for it’s sins. Here is Simple Minds amping up the emotional tension and flirting with the ethereal. The bass and keyboard coda brings a smile to my face. Pleasantly Disturbed is Post Punk Cabaret! Full of darkness and sleaze, Burchill’s guitar treatments are a subtle but menacing. There’s a glam/prog reference in the Jobson like violin work, but it’s limited and not a full blown self abusing (like what I did there?) solo – a primary tenant of early Post Punk. Echorich – !!! By Jove, you may have something there, laddie! Echorich – There’s a lot to be said for bands having the time and space to develop. How I miss that in the end times we live in! The ride to the top of the artistic curve is exhilarating. I so agree. My favorite bands seem to have all followed a path of musical exploration – Magazine, The Bunnymen, New Order, Simple Minds, Bowie – of course, China Crisis, The Stranglers, Icehouse…you know I can go on and on. All of these bands have their “imperial period.” Many would hit a wall or succumb to the power of the record company success machine, but none just sat back releasing the same music album after album. Things just aren’t set up to allow for that anymore – they haven’t been since the late 80’s if I think about it. Music has become another form of instant gratification instead of constant obsession. This album has never done much for me, probably because they took such a great leap forward with album #2, but I don’t want to get ahead of the GPA so I won’t say anymore. I haven’t listened to this album in full in many years, but I’ve had “Chelsea Girl” and “Life in a Day” in my iTunes Library for at least that long. This post made me pull up the iTunes Store entry and awaken some long-sleeping brain cells as to how good this album was! The remastered version now needs acquiring!! chasinvictoria – Oh, it’s a fairly decent first album. But their development arc went into overdrive immediately afterward, so this one gets left behind as it’s the runt of the litter. Taken at face value, it’s very listenable with a fairly wide, albeit derivative, scope. Though if it had been their only album, the world would have been a less exciting place.